Well, I certainly think the 2016 Jets offseason will be far more interesting than the preceding regular season campaign. In the standings, they were very unsuccessful, but I think a good argument can be made for the success developing key players that will be a big part of our future. I'm pretty excited to speculate and discuss moves and what the roster will look like in October. Who needs to go? What will the goaltending look like? Who will make the jump from junior/Moose to the big club? Mods, can you pin this? Glad to see this chatter is starting now ........ some thoughts will be fresh & the opinions subject to many factors & decisions in the near future. Do we get a top 3 Draft pick or further back, if the odds remain true, in the selections process ......... April 30th is close approaching. On "D" we ended with Myers & Enstrom watching while Chiar, for a great part of the season, Post & Melch for part of ..... gained experience. Anxious to see if Morrissey is a threat next year to either 3 or Enstrom. Would like to see Hamonic in a Jet uni but is Chevy interested in making that happen. Stuart, somewhat valuable, I hope is in the press box most of the year. Up & comer Poolman & Kichton are probably with the Moose. Forwards can sure get better with Little & Perrault in the lineup. Is Thorb finished ? Can Tanev, Armia & Petan stick & contribute ? Early line predictions: ESW is #1, Little centers Petan & Stafford (or Armia), Copp centers Perreault & Armia, Lowry is with Tanev & Kosmachuk. Personally want to see Burmi traded & Thorb as the extra forward & Dano preferably with the Moose. Hope Conner stays at Univ., another year. IMO Hutch is gone this offseason either in a trade for a 4th/5th rounder or outright (more likely). I see Pav as the starter and Helle backing up to start the year, with Helle getting a substantial number of starts, especially if he gets hot. If that happens or Pav gets injured again, I think that's when he is officially christened starter. In that case Pav will remain an (expensive) back-up, and they might try to trade him depending on what they can get for him (i.e. who else has injury issues and needs a proven starter) as well as our playoff hopes. If we are locks, it might be more prudent to keep Pav all year in case of injury or if Helle's wheels fall off because it turns out he can't carry the team a whole season and into the playoffs by himself. That gives us options. Comrie will be #1 with the Moose and could be the backup with the big club by 2017. Nope.... That will never happen. You can't be serious. No way any team even entertains such an idea. I would doubt we keep Pav. Hes not the future and we have seen what we will get from him. Im not bashing Pav i just dont see any reason to keep him. So, what happens to him? No team is going to take him off the Jets' hands with his upcoming cap hit. The likely scenario is the Jets go into training camp with he and Hellebuyck battling for the #1 spot. Pav will get moved. My guess he will be packaged up with a player and a pic. What team out there would be willing to take that cap hit? You seem to ignore that crucial point. Not ignoring it ... I dont know what team will but it will happen. He will get packaged with a guy like Postma and a pic...3rd.... and we will get 2 back like a late 2nd and a late 3rd. Pav is doing nothing but plugging up a spot. This will be a deal we will loose at a bit but sometimes you have to take that hit. We have a ton of pics and prospects we can afford it. I cant see us getting alot back for Hutch so i dont see moving him so you move the guy thats not in your plans and that would be Pav. If we end up with Pav/Buck as a tandem, the cap hit is normal. Whether we start one or the other matters not. It will be a good opportunity to let Buckbuck compete/win the starting spot, while Comrie continues in the A. Hutch is an RFA that we got for nothing, and probably has little value to anyone else. If we can sign him to a 2 way deal and have him in the A backing up Comrie and ready to step in in case of injury for the big club, great. 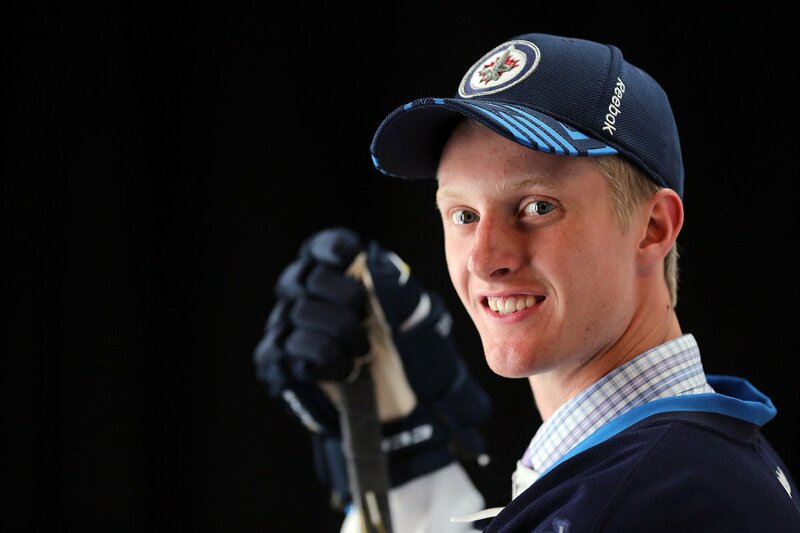 #NHLJets announce it is a 3 yr, two-way deal for Kyle Connor, worth an avg of $1.775 million.